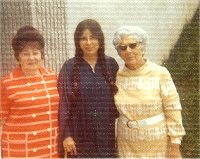 Here I am on the day I graduated from high school with my two proud grandmothers. I was born in Brooklyn, NY in a neighborhood called Brighton Beach. I could see the ocean from my bedroom window and the beach was my backyard. In second grade, my family moved to Long Island, to a town called Jericho. Both my grandmothers remained in Brooklyn, so I still spent a lot of time there. I attended Public School 253, George Jackson Elementary School, and Jericho Junior and Senior High School. What kinds of books did you read when you were growing up? I loved books about animals. My favorite book was called Caroline and Her Friends, by Pierre Probst. All Caroline’s friends were animals: Rusty the Dog, Bruno the Bear, Inky the Cat. I also loved Winnie the Pooh by A. A. Milne, Black Beauty by Anna Sewell, and The Incredible Journey by Sheila Burnford. Other favorites are Little Women by Louisa May Alcott, The Phantom Tollbooth by Norton Juster, Harriet the Spy by Louise Fitzhugh, and Anne Frank: The Diary of a Young Girl, by Anne Frank. Yes! Ever since I can remember, I have always wanted to be a writer. I was the kind of kid who was always reading a book (except when my mother caught me reading under the covers with a flashlight and I had to put my book away). The public library was my home-away-from-home. From everywhere—from my dreams, from things that happen to me, from things I read in the newspaper, from my imagination. I try to stick to a writing schedule of writing every morning, Monday through Friday for several hours. Sometimes, if I am in the middle of something, I’ll write on the weekends as well. Other times, if I am between projects, I’ll take a little time off. Do you write on a computer? When I start a story or a poem, I begin by writing in a spiral notebook with a Bic medium point pen (either black or blue). Once I have a first draft written, I type it into the computer and edit it. Before I had a computer, I wrote everything out with a pen and then typed up the final draft on my typewriter. Each book takes a different amount of time, from several weeks to several years! Every book goes through many drafts. I just wrote the fifteenth draft of a picture book I have been working on for seven months. What is your favorite of your own books? Whichever one I’m working on! I went to two colleges: the University of Vermont, and Naropa Institute in Boulder, CO. I graduated from the University of Vermont with a B.S. in Education. My major was Creative Writing and Social Services. I received a Certificate in Poetics from Naropa Institute, where I apprenticed with the wonderful poet, Allen Ginsberg. What kind of jobs did you have before you became a writer? When I was a teenager, I delivered newspapers and babysat. When I was in college, I worked in an ice cream shop. After college I worked as a day care teacher, a newspaper reporter, a salesclerk in a clothing store and a secretary. I also taught writing for many years. I have a beautiful 12-pound cat named Neshama (her name means “soul” in Hebrew). Over the years, I have had many cats in my life including Princess Sheba Darling, Precious Sammy Dearest, Couscous Kerouac and P.C. (Perfect Cat). And when I was growing up, I had a Cairn terrier named Angus. What would you tell a kid who wants to be a writer? Read, read, read! Read every book you can get your hands on. And write, write, write! Make a writing schedule for yourself and stick to it. What if I don’t know what to write about? There are many, many books of writing exercises—buy one, or take one out of the library and use it as a guide. Or take a writing class or join a writing group. If you can’t find a group, start one! Like most writers, I love to read. I also love to hang out at home with my spouse and our cat. And I like going to the movies and to the theater. I do the New York Times crossword puzzle every day. I eat dark chocolate as often as possible. And I love to shop! I like so many writers, I can’t name them all, but some of my favorite writers are the women in my writing group: Jane Yolen, Patricia MacLachlan, Ann Turner, Corinne Demas, Ellen Wittlinger, and Barbara Goldin. They are all wonderful writers of children’s books. 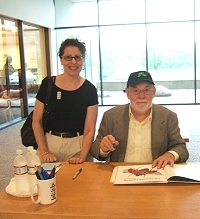 I also enjoy the work of other children’s book authors who live in western Massachusetts, including Rich Michelson, Mordicai Gerstein, Norton Juster, Eric Carle, Grace Lin, Mike Curato, Jeannine Atkins, Lisa Yee, and Lisa Papademetriou.